This is a simple recipe with raw mango. 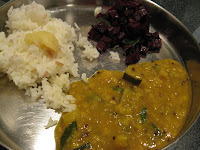 My MIL taught me this one and she told me that this recipe is famous is north arcot side. I am basically a mango lover. So I like this recipe and made this last week. Here goes the recipe. Cook the toor dhall with a pinch of turmeric powder. Also cook the mango till it is 3/4 done. In the mean time, pre heat oil in a pan, splutter mustard seeds, add urad dhall, green chillies and ginger and saute for a minute. Now add the 3/4th cooked mango to it along with 1/4 cup of water. Add the remaining turmeric powder and let it boil for couple of mts. Now add the cooked toor dhall to the above ingredients, add salt and let every thing mix together for another 3 to 5 mts. Adjust the water according to the required consistency. Garnsih it with curry leaves. This can be eaten as side dish for even chapathis, main dish along with rice. My MIL usually ask us to eat this as a side dish for paruppu saadam. That is one tangy daal! do you pressure cook the mangoes or just put them in boiling water? 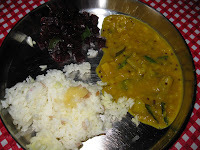 yummy dal vidhya..It is new to me.. will try this..
Can I use this leaf??? ?